Disclosure: Some of the links to products below are affiliate links, meaning, at no cost to you, I may earn a commission if you click through and make a purchase. It helps me create content like this for you, and I thank you for your support. 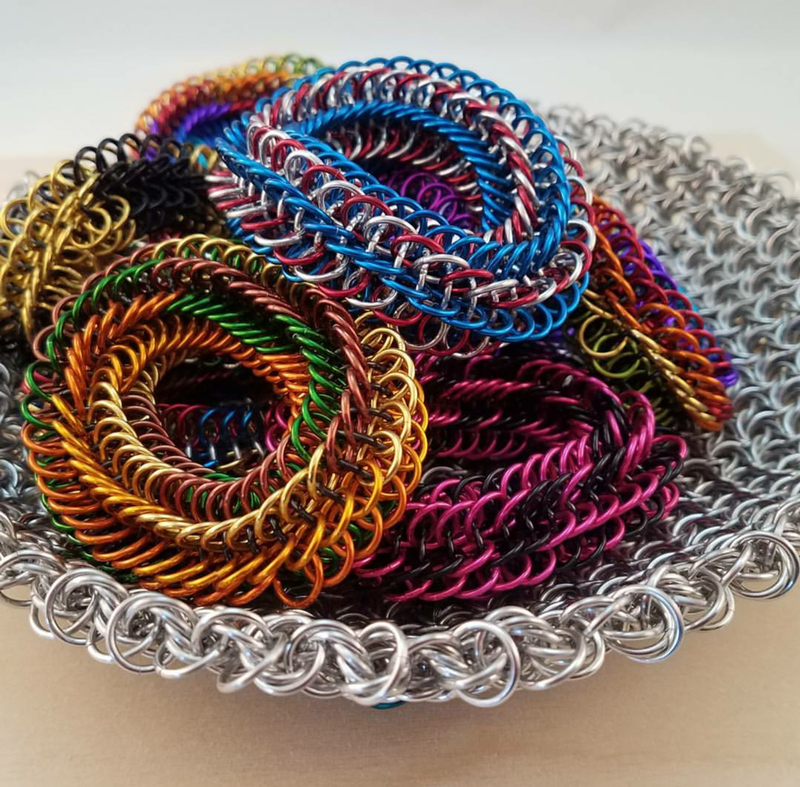 Every month in our Meet the Artist series, we chat with a different chainmaille artist to find out more about their process, inspiration and goals. We also try to uncover one or two things you might not know about the artist, even if you’re already familiar with their work. 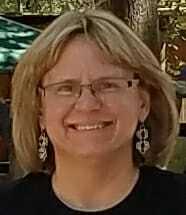 In this edition, you’ll meet artist Lisa Ellis from Leander, Texas. I’ve always been in awe of her Moorish Rose creations, so excuse me while I fangirl for a few moments here and there. Enjoy, and please post your comments below! Thanks for taking some time to chat with us, Lisa! 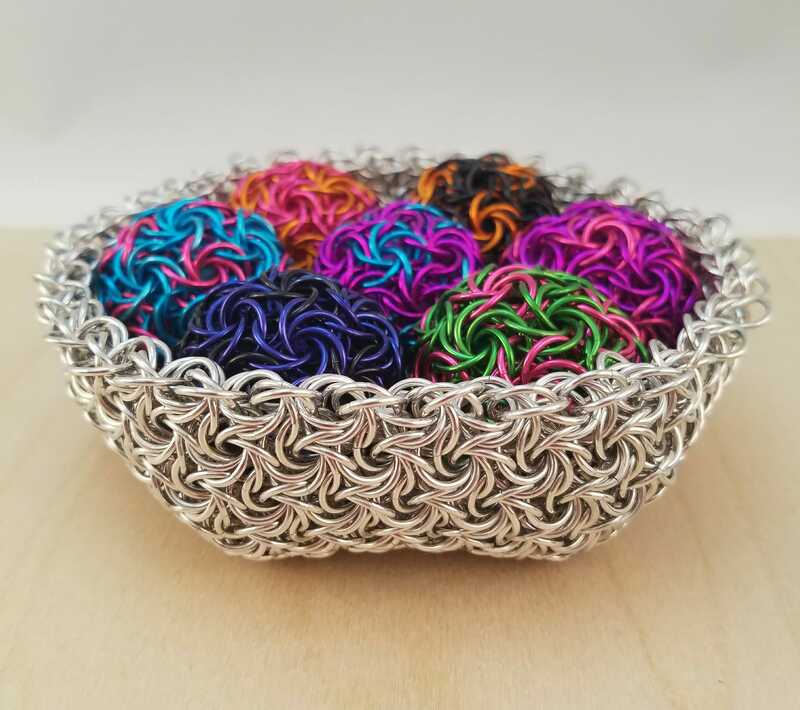 When and why did you start making chainmaille? Six years ago I went to my first renaissance faire, and it was there that I discovered chainmaille. I had only seen it in history books before, and I was just fascinated by it. I had to know how it was made. 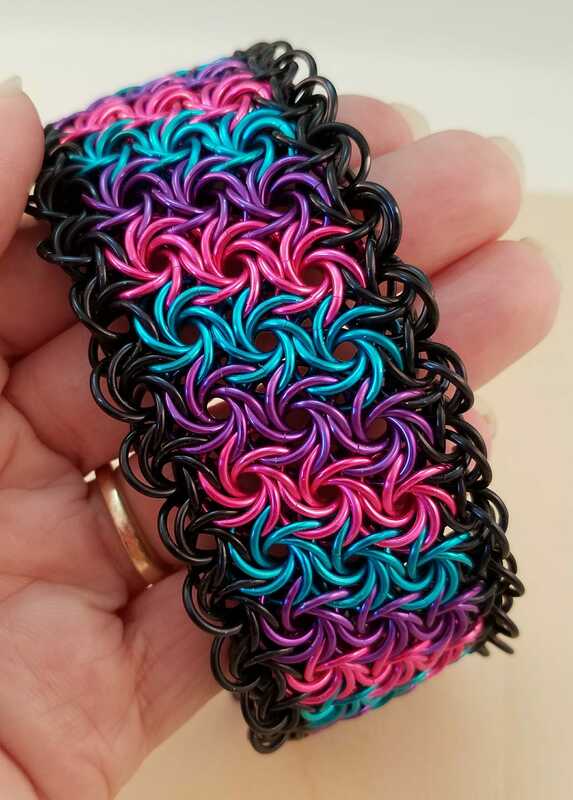 My first project was a Helm bracelet, and it was terrible! I wasn’t giving up, though. 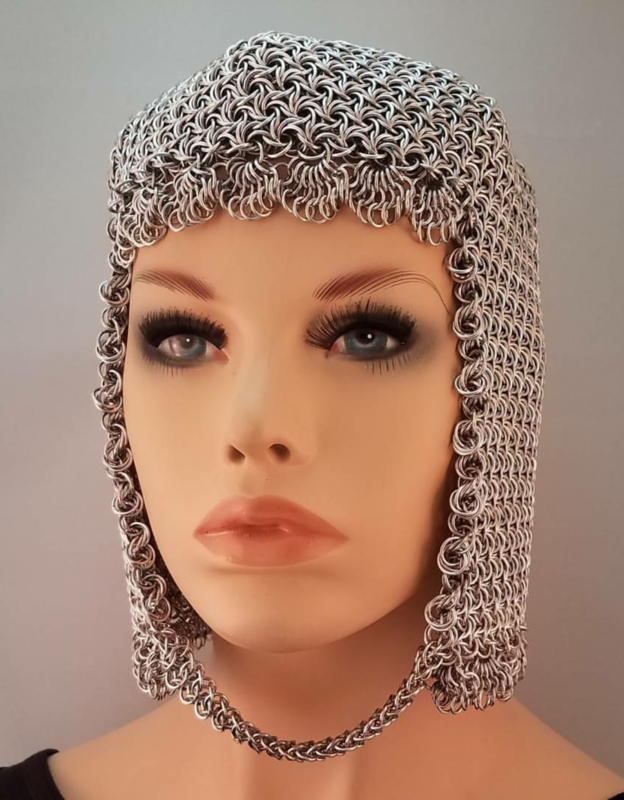 I knew already that chainmaille was for me. I liked how it looked and how it felt. I liked that it was hard for me, that it made me think. So I kept at it. I discovered the M.A.I.L. database. Woah! So much to learn! I keep challenging myself to learn new weaves, and I’ve discovered that I really, really love sheet patterns. When I think of your work, the first thing that pops into my head is Moorish Rose. How did you become so fascinated with this insane weave? I love Moorish Rose because it’s a sheet, it’s swirly, and it’s mesmerizing! And I like that by adding contractions it can be shaped into things like bowls and truncated dodecahedrons. I’m always looking for new ways to use it. 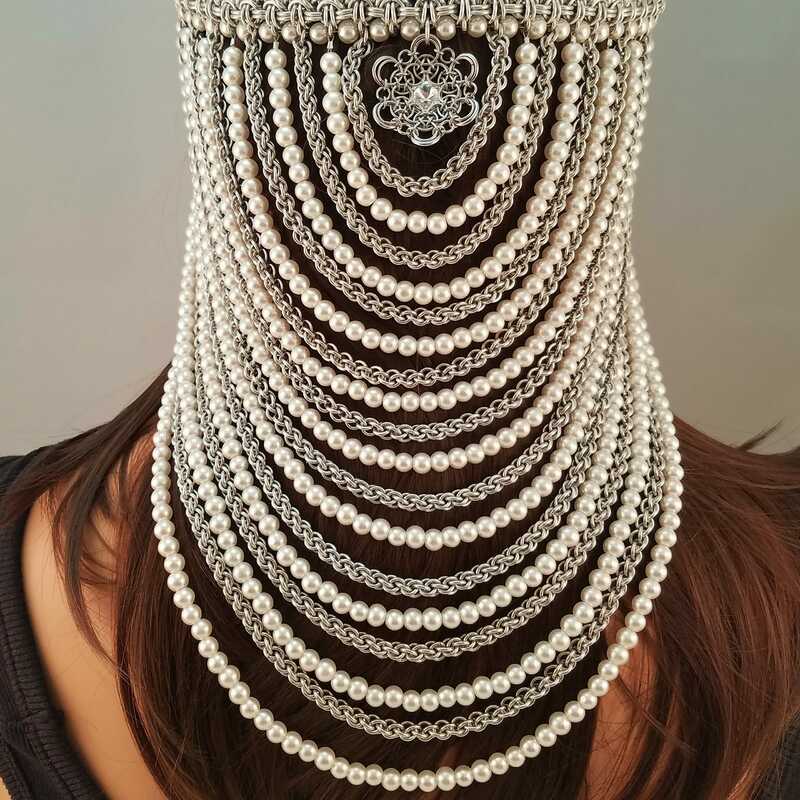 My favorite Moorish Rose project so far has been a kind of helm/coif hybrid. It’s an unusual piece, but interesting I think. Recently I’m discovering the vast opportunities for color manipulation in Moorish Rose, not just mobius to mobius, but within the mobiuses themselves. I’m very excited about the design possibilities. What general advice would you give to someone who wants to learn Moorish Rose? Asking for a friend. Be persistent. It’s a rare person who can pick it up on their first try. I’ve made a YouTube tutorial for Moorish Rose that may be helpful to you. I think seeing how the weave works in 3D is really useful. If that tutorial doesn’t work for you, don’t give up, try another. I’ve heard that Joshua Diliberto has a good one. The weave is so pretty, and so satisfying to make, your success will be worth the effort. What’s your favorite alternate name for Moorish Rose? 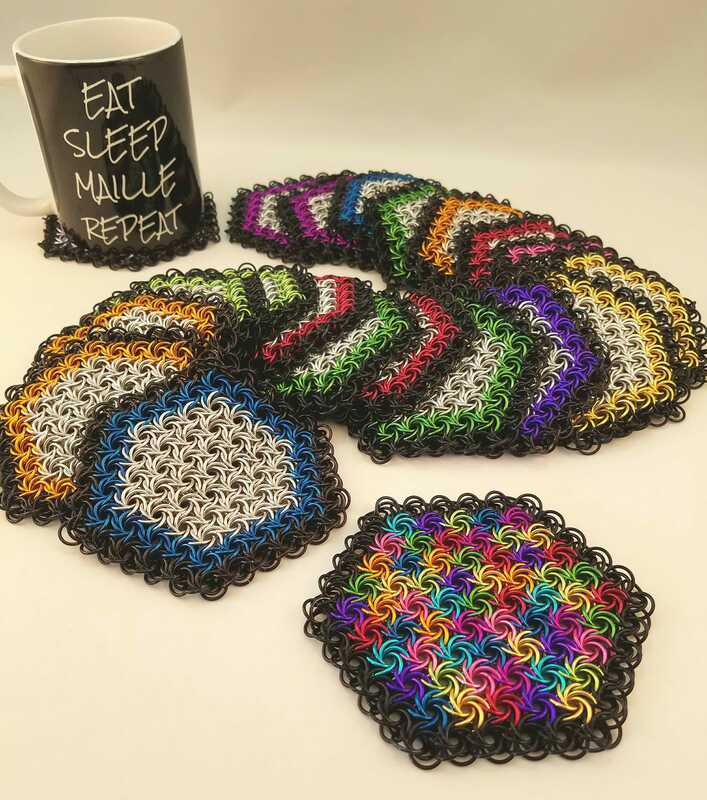 When I posted on Facebook that I was seeking questions for you, the accompanying photo showed your Moorish Rose coasters plus a chainmaille mug. So of course the burning question that just about everyone had: Is there a tutorial for the coasters? I didn’t know people were interested in this, so not at the moment. I think maybe in July I can set about making one. If you do create a tutorial, you’ll sell tons! Be sure to let me know and I’ll post to the Blue Buddha page on Facebook. Creative people of all types, whether their interests lie in art, science, architecture. The field doesn’t matter. It’s their enthusiasm, their willingness to take a chance with a new idea. Creative people encourage me to push myself, to think out of my box, and to be my best. How do you come up with new designs? When you have an idea for a new design, do you pattern it out on paper first, or just dive in and make a design from there? Oh, I just dive in. For example, I wanted to make a coif out of Hoodoo Hex. I’d never made a coif, had no idea how to make one, but I went for it anyway. I just started weaving. 17,000 rings later, I’d finished, and it’s now one of my favorite pieces. My work pretty much always starts with me picking up my rings and playing. There’s one exception, and that’s the Infinity Rose. The idea for the base weave popped into my head while I was getting TENS therapy at my chiropractor’s office. It’s weird how that works. How many hours a day do you weave? This varies a lot, depending on what I’m working on. When I’m really excited about something it can be 10-12 hours a day for weeks. Other times 4 or 5 hours. This Winter I took a three month break from weaving completely. I definitely wasn’t planning on quitting, I just needed to recharge. Now I’m in the super excited stage again. 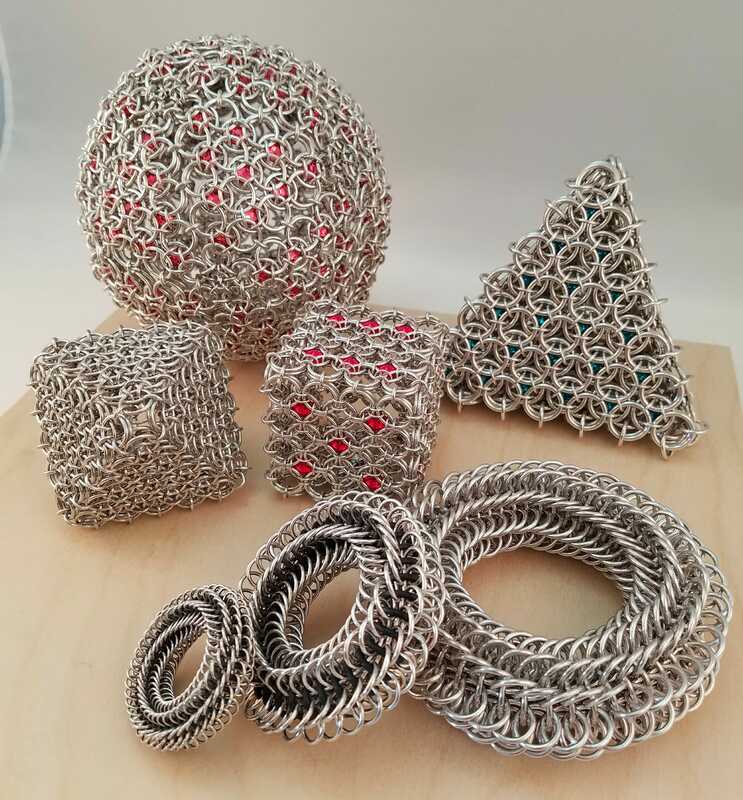 Once my latest orders of rings get here I anticipate some intense weaving. OMG! I’m glad you asked. I’m planning a Moorish Rose inlay! I’ve chosen Van Gogh’s Starry Night. I think the movement of the weave could work nicely with the visual motion of the painting. It may be an impossible undertaking, but I’m going to give it my best shot. The finished inlay (if I can do it) will measure 33’ x 41,” and I expect to use almost 50,000 rings. What is one tool that you cannot live without? 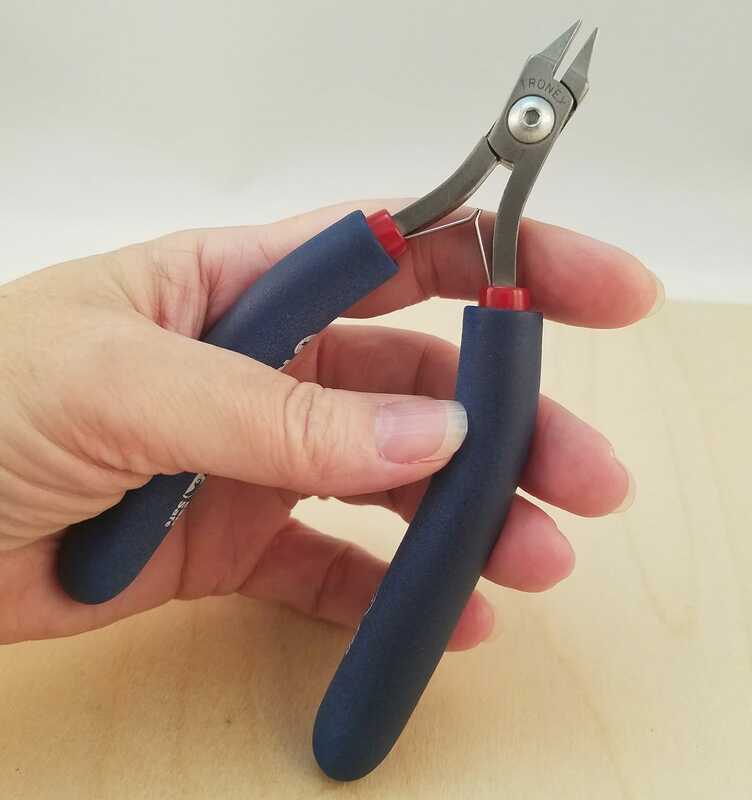 No doubt about it, it’s my Tronex snub nose pliers. I use them for almost every project. If I need to, for smaller work I’ll use a pair of Tronex oblique nose in my left hand, but the snub nose accomplish nearly everything I need. If I’m in a pinch for teensy work, I’ll use my Xuron chisel nose. And….probably the most unusual question that has ever come in—and, haha, I figure there’s an inside joke here—If I wanted to buy a creepy mannequin, which store should I burn to the ground? I suspect that Stephen secretly loves my mannequins. In fact, if any of you have any extra mannequins lying around, I suggest mailing them to him immediately! 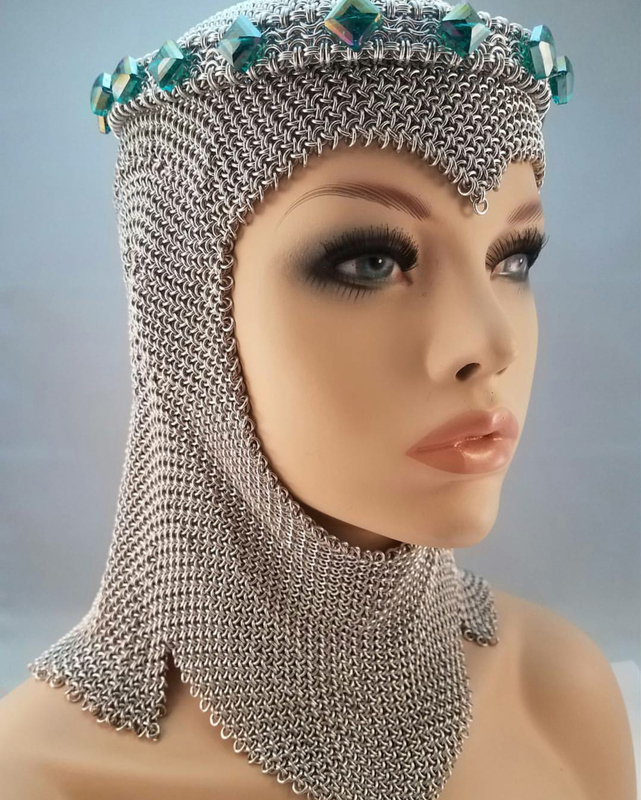 OK, onto some quick questions: What do you do when you aren’t making chainmaille? My husband and I love attending renaissance fairs. We’re lucky that we’ve got three within a couple hour drive of our home. This year we’ve started camping out, and are loving meeting some of the other rennies. We love to travel too. Now that our kids are grown, we’re trying to check some items off of our bucket list. So far we’ve been to the United Kingdom and Greece. This year we’re headed to the Baltics. I’m so very grateful we have this opportunity. My guilty (not so guilty) pleasure is RPG video games. Mass Effect, Skyrim and Arc are my favorites. Do you listen to music/podcasts/tv/etc while mailling? If so, what are your favorites? I know it sounds boring, but usually I have the news running quietly in the background, but sometimes I put in a movie. I love, love, love really bad Sci-Fi movies. Tremors and Mega Pirahna are two of my favorites. My father will always be my favorite artist. I loved his wood sculptures best, and as a kid I would watch him work for hours. He also painted and sketched, and he had some mad airbrush skills. I’m sure we were the only family in Pennsylvania with a full rendition of the Battlestar Galactica gracing the side of their Blazer! 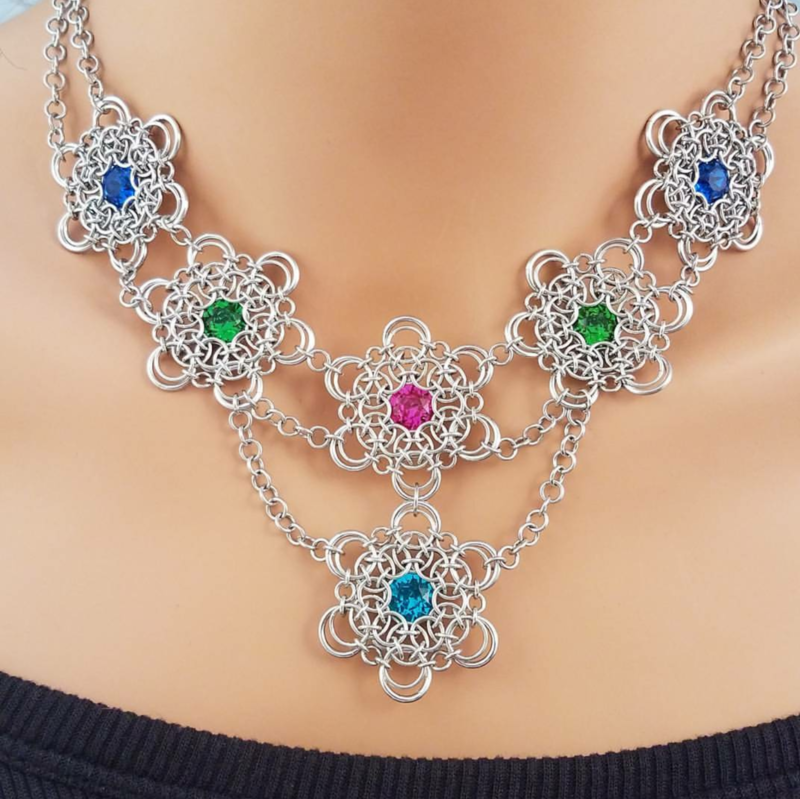 Some of my favorite chainmaille artists are Simon Menz, Kirk Nelson (Brilliant Twisted Skulls), Tony Moeller, Nathan Asselin, Deborah Wilson Taylor, Daniel J G Miller, Kristina Griffin, Stephen Hoffman, Joshua Diliberto…. I could add so many more. The power to heal people. I hate to see people suffering. It may not be the best piece of advice, but my favorite is when my Dad used to tell me “just don’t get caught” with a smile on his face when I was a teen. ROFL! What’s one thing Blue Buddha readers might be surprised to know about you? I met my husband in the mosh pit at a Violent Femmes concert! I can’t believe it’s been 33 years. I love him so much. 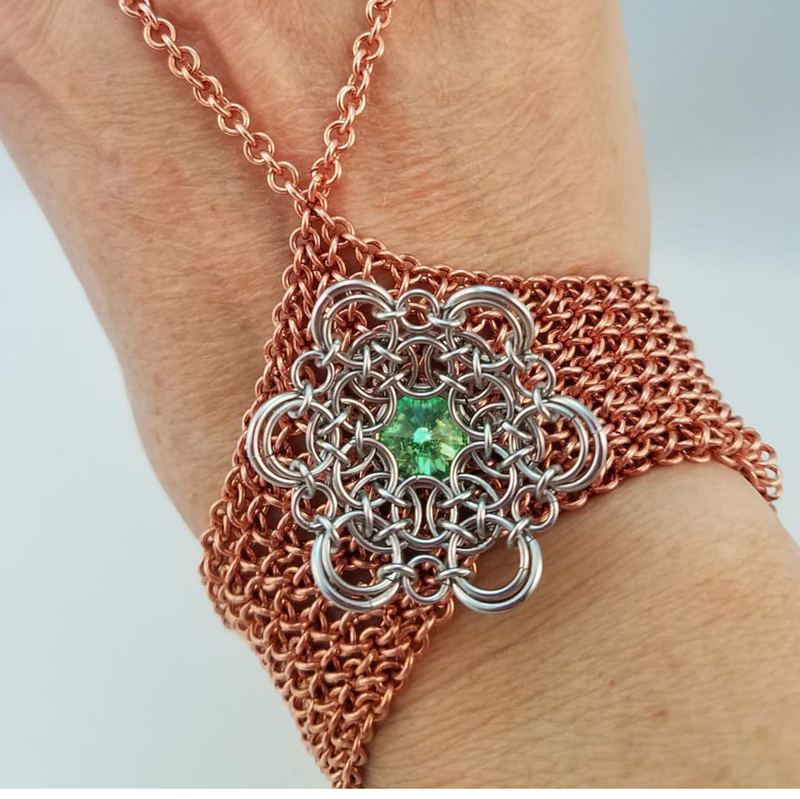 I’d just like to say how grateful I am to be a part of the chainmaille community. Chainmaille people are just about the nicest people I’ve ever met. Thank you, Rebeca, for the opportunity to share a little about myself. You are an inspiration to me, and one of my idols. I think the first chainmaille book I ever bought was one of yours, so I have much to thank you for. Awww, that’s so kind of you to say. I am equally in awe of your work! Before we let you go, please tell us where we can find your chainmaille. Thanks so much for taking the time to chat with us, Lisa! 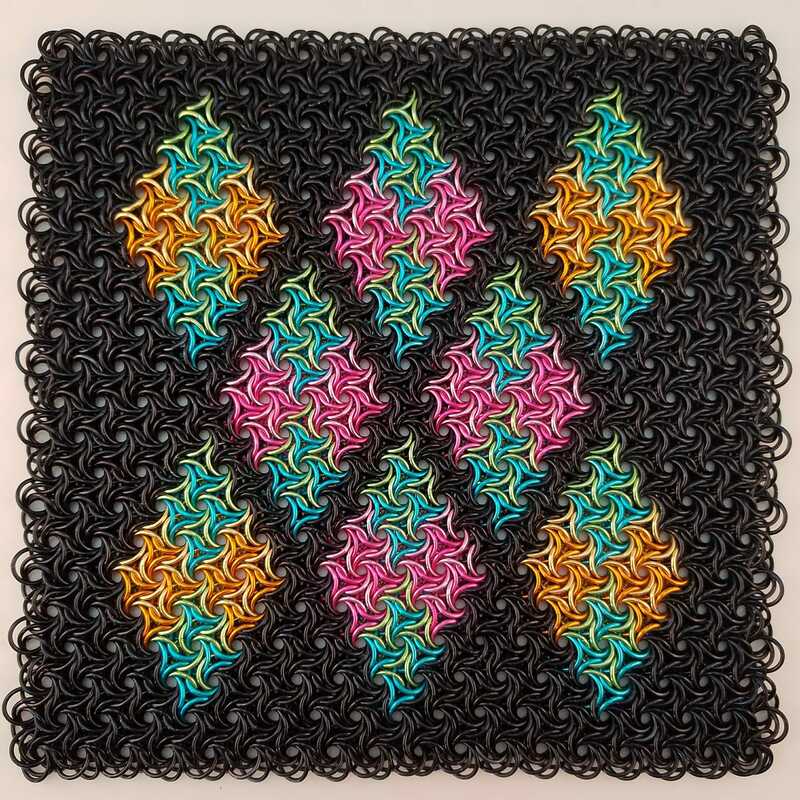 We wish you much continued success and we are soooo excited to see how your Starry Night Chainmaille project turns out! And thank you to everyone who’s read this interview to the end. While you’re here, be sure to check out the previous “Meet an Artist” posts: http://www.bluebuddhaboutique.com/blog/category/ask-an-artist-series/ and let me know if there’s anyone you want to see interviewed. ‘Til next time, happy weaving!